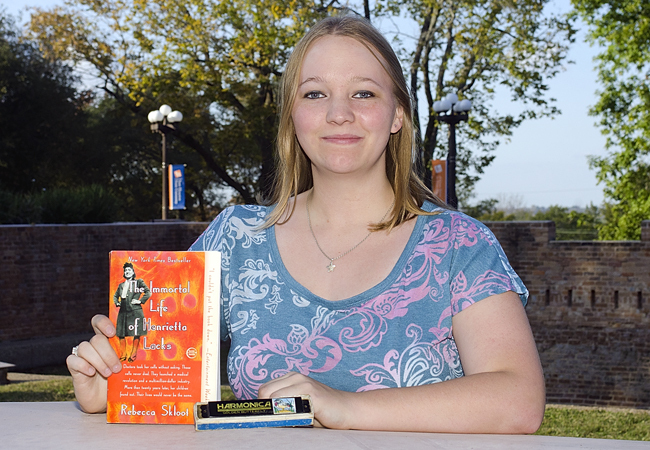 Freshman education major Michelle Harris was selected as the winner of the inaugural Bearkats Read to Succeed essay contest held this fall. For the contest, students were asked to relate their personal experiences to this year's common reader selection 'The Immortal Life of Henrietta Lacks,' by Rebecca Skloot, following the theme of coping with illness, overcoming adversity, or confronting an ethical dilemma. As the winner, Harris received a $500 scholarship from the First Year Experience Office. 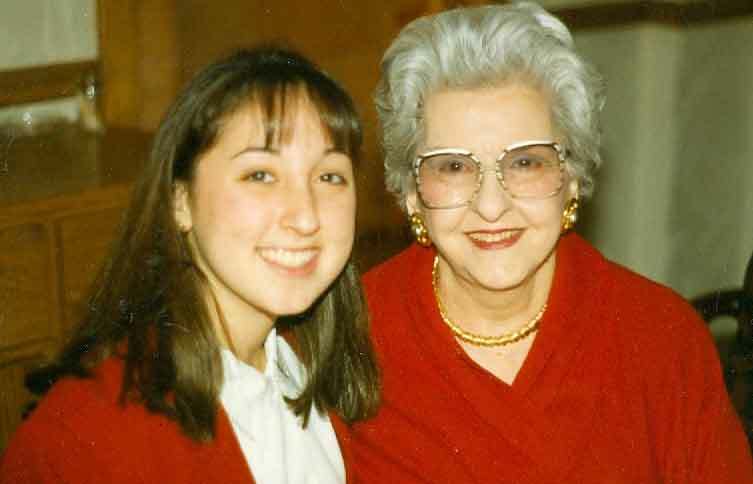 In her essay below the League City native and SHSU Honors College student discusses the loss of her grandfather. The narrative is published as submitted, with no amendations. When I gazed into the eyes of my grandfather and hero, I had no idea that those familiar blue eyes no longer knew who I was. I knew he was stumbling in life and that for the first time in over fifty years, he was separated from my grandmother and placed into an assisted living community. My hero was falling, but to what extent I failed to grasp until that first and most difficult visit. No one in the family knew my grandfather suffered from Alzheimer’s until the disease had already run rampant throughout his strong mind, much to the comparison of Henrietta’s cancer which claimed her body. It turned his memories against him, seemingly repositioning his axons and changing the Vietnam hero and sheriff into a man who knew not even himself. With each visit he seemed to only split further, confused at the simplest of tasks and often forgetting his identity, leaving the family to mourn the loss of a man so great. Though he was with us for over six more months before being called into Heaven, that which distinguished him as family was stripped away within weeks. There was no longer the soft hum of the harmonica when I entered my grandmother’s house, and there was no longer the depression in the couch cushion where my grandfather relaxed with the newspaper while enjoying television. When the time came that he was taken into Heaven, my family mourned greatly. Each of us shared our memories with one another to celebrate his life, and watched as he was laid to rest among his former comrades from war. With the Veteran’s salute and rifle fire, he vanished from our eyes and into a much more welcoming place, away from the troubles of this world as my family has always believed. It was not long after his death that my grandmother surprised me with the gift of my grandfather’s truck. It was an older Chevrolet that had seen better days. It was losing its paint, had dents along the side, was riddled with scratches and BB gun dents, and had no air conditioning. Many people had suggested my grandfather sell the truck years ago to purchase a vehicle in better condition, but he insisted instead on working to provide for his wife and family. He was a true believer in the value of hard work and thought that the most important things in life didn’t carry a price tag. When I went to work on repairing it and cleaning it up, I found sand in every crack and hinge from the countless times my grandfather drove us along the beach, rushing over the dunes as we bounced in the truck bed with laughter. I found old shotgun shells from the days when he would take us hunting and tell us tales of the old days of his youth. In the glove compartment, I found old title renewal forms and the manual, all carrying his handwriting in little notes and details about the truck’s mileage and last oil change. Old maps were riddled with coloration as he plotted out different trips and vacations, many of which I had heard stories from. The toolbox contained all of his old tools—lanterns for camping, pocket knives he collected, chains he used to drag his friends out of the mud should they ever have gotten stuck, and old dirty gloves that illustrated his hard work to fix that which required fixing. Each of those pieces simply brought back more of my grandfather’s life, and the fact that I was the one to receive them made it worthwhile. It was several weeks later that I finished cleaning, and in the last little pocket on the driver’s door, I found a true treasure, my grandfather’s harmonica. Members of my family would swear that my grandfather never left home without that harmonica, it was his signature token and he taught himself to play as a young man. No holiday celebration was left without all the grandchildren sitting in his lap as he played a tune for all of us. When I held that old harmonica in my hand, I was able to really look at it with a newfound appreciation. Though it had lost a screw and the faceplate had come loose, it opened the floodgate of memories from my childhood about how amazing of a man my grandfather truly was, and how he never complained about the difficulties in life. Inspecting the little instrument, I took notice of its imperfections with a smile. Like my truck, the harmonica had its aesthetic flaws, all of which told their own story. I realized that nothing in life is meant to be perfect, not with people, ideas, or objects and though my grandfather passed away a few years ago now, he has taught me life lessons through his memories that otherwise I feel I would have failed to comprehend. Through the pieces of his life that remained after he moved on and as I grew to cope with his illness and death, I have come to realize the value of dedication and hard work, and how it is through our actions and words that we make this world a better place. Sometimes people forget the value of a warm smile, a hug to those in need, or even the value of dedicated work. It’s not about who has the nicest things or the most money, but who leads their life with a warm heart. As I remain here today driving my truck with pride with harmonica in suite, I’ll never forget the influence of my grandfather and his life, nor how even after his death, he changed my life. Though I miss him greatly I am proud to remember that every time I turn the key in the ignition, I know he rides along with me in heart, reminding me of life’s smallest and greatest blessings.